Imagine yourself eating lunch today at noon. You continue your work until it’s time to go home at 5:00, eat some dinner with the family, catch a movie at the Linway Plaza (after all… it is Friday. However, upon further inspection, there really isn’t much worth watching at the movies right now), put the kids to bed, and get 9 hours of sleep. Now, right about the time you wake up, imagine yourself having spent the entire past 20 hours exercising; from lunch until waking up! That’s exactly what our Tough Mudders were up to last Friday, except they began their workout at 7:00 rather than noon. I wanted to grab a little video and some photos this time around, but unfortunately did not have the time available to workout with them on Saturday morning like I had planned. So, I met them at their first stop; Ox Bow Park. Basically, their goal was to mimic as best as they could the event they’ll be racing in November. They’d run to a park, practice some strength, balance, and obstacle exercises, and the continue running on to the next park they had mapped out. This continued on all the way from the parking lot at Meijer (across from Ox Bow Park) to Crossfit Michiana, and then they worked their way back again. They even strategically prepared a stop where they could don themselves in wetsuits, and traverse in and out of the Elkhart River to get used to wearing them sopping wet and cold. They gained some valuable insight by doing this. They now know to use much more lubrication on the inside of the wetsuits to cut down on chaffing. brought much needed encouragement to them in what had to seem like a never ending workout. Jed also was awarded a free 60 minute massage here at CCWC for being the toughest person to join the guys during their workout (ok,so he was also the only one to do so (Chicago Mudder didn’t count)).
! 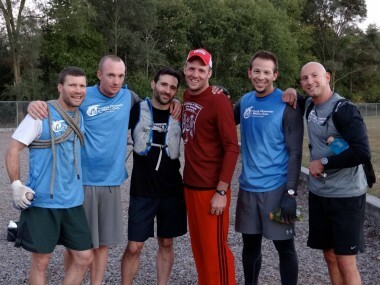 As always, we will keep you posted on their progress, training, and eventually their result at the World’s Toughest Mudder. A short time ago, we introduced you to the Tough Mudder team we are sponsoring who will be competing in the World’s Toughest Mudder competition later this year. It’s roughly a 10 mile obstacle course they’ll be running as a team in November. Sounds doable right? Oh yeah, I forgot to tell you…they aren’t just running this course once, but as many times as they can in 24 hours. 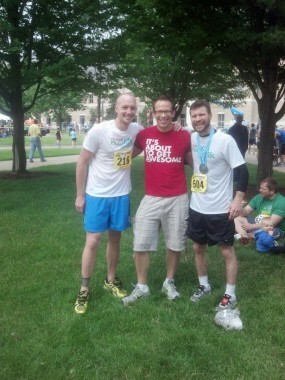 Kevin, Jeremiah, and Jonathon after the race. Jeremiah was there providing support. “Hello, my name is Andrew Rumfelt. I am 35 years old, a husband and father of 3. I am a corporate pilot for Jet Aviation Flight Services; a General Dynamics Company. Last week we informed you that we are the proud sponsors of a team of four men that will be competing in the World’s Toughest Mudder. Now, it’s time to get to know them! First up is Kevin.